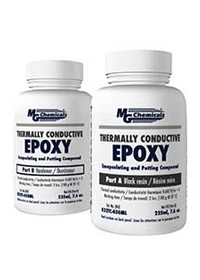 MG Chemicals Thermally Conductive Epoxy is 100% solids. It provides all of the protection our standard potting compounds do, but allows trapped heat to escape more readily.This is designed to be a high quality solution. It is formulated with undiluted Bis F resin, so it has superior physical properties to conventional diluted Bis A systems. Cured with a polyamide, it is not as brittle as the more common amine cured thermally conductive systems, and can be machined to shape.